Pothole, Schmothole, it’s time to put the Daytona 500 behind us. With the exception of Daytona winner Jamie McMurray, all of the NASCAR Sprint Cup drivers did that Monday. Now it’s time to start the real Cup season. Don’t get me wrong. Daytona is a very important event. It’s called NASCAR’s Super Bowl for a good reason. Winning the 500 is one of the biggest things any driver can have on his – or someday, maybe her – resume. But it’s a season unto itself. And it’s over. The teams spend the entire winter preparing for a race that has almost no relationship to 32 of the 36 races that make up the Cup season. They build special engines to deal with the carburetor restrictor plates that NASCAR mandates for the two races at Daytona and the two events at Talladega. The cars that will run Sunday at Auto Club Speedway in Fontana, Calif., look to the naked eye the same as those that ran at Daytona last Sunday. But there are subtle differences that are worked on and perfected in wind tunnels all winter just to take advantage of the drafting on the big Daytona track. The springs and shocks are different too. Dale Earnhardt Jr., who desperately needs a good season to yank himself out of a two-year funk and prove that he is still one of the top drivers in the stock car sport, finished a stirring second at Daytona and immediately put it in perspective. From a negative standpoint, the last two drivers who won the Daytona 500 – Ryan Newman in 2008 and Matt Kenseth in 2009 – didn’t make the Chase for the Cup championship. Kenseth even made it two wins in a row at California and struggled the rest of the season to finish 14th in the points. Kevin Harvick won the big race in 2007, finished 10th in the standings and hasn’t won a Cup race since. On the other hand, a bad day in the 500 isn’t a disaster, either. That’s the reason that four-time defending Cup champion Jimmie Johnson isn’t all that worried his fourth consecutive bad start at Daytona. This time, it was a flat tire late in the race that relegated Double J to a 35th-place finish. No worries. He’s got 25 more races to make up for that bad day and put himself among the 12 drivers who qualify for the 10-race Chase. And Johnson goes into this season as the only driver to have made it into the Chase every year since it began in 2004. Denny Hamlin, who hopes to be the driver to unseat Johnson as champion, got off to a so-so start at Daytona, finishing 17th. But he’s looking forward to starting to find the groove in California. “Why is this race at California important? 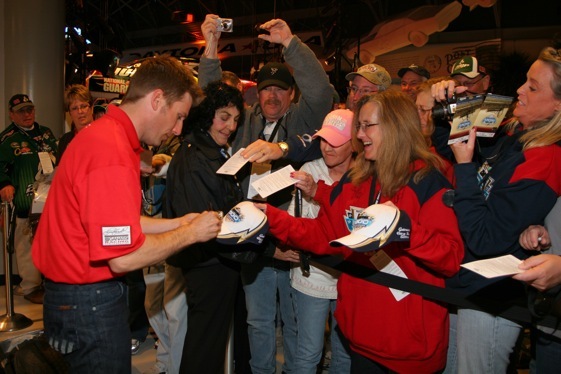 “ Hamlin said. “All of our hard work over the off-season is going to show up right here in California. This is the first real race track that we go to where the setups are going to matter, the driving and all that is a lot different. McMurray, who won Daytona in his first race for Earnhardt Ganassi Racing, is anxious to see how the team stacks up on the intermediate tracks that make up the bulk of the Cup schedule. Teammate Juan Pablo Montoya was solid on the 1 ½ and 2 mile ovals a year ago, racing well enough to make the Chase. Good attitude. It’s a long season and we’re just getting started.